***** MUST BE OVER 18 YEARS OLD TO PLAY OR BE IN HALL DURING GAMEPLAY. Admission Ticket —- When you purchase your packet, you will be given a numbered admission ticket.SAVE THIS! Twice during the evening, we will draw a winning ticket.The winners will receive a voucher entitling them to play the same amount of card faces the next time FREE !!!! This voucher must be used within thirty days. Station 60 Game —- The price of this game is now included in your packets.We will add $1.00 (for every packet sold) into a jar, and we will add $1.00 every time (G-60) is called. The first player to bingo on (G-60) on any game (EXCEPT Bonanza, U-Pick, Jackpot, and Quick games) will win the contents of the jar, plus the game payout.The contents of the jar will roll over until there is a winner.There will be only one Station-60 payout per night. Bonanza Bingo —- This game requires a player to cover their entire card. It is played on a single paper card (sold separately for $1.00 ). The game begins with 48 numbers drawn at random.The prize for a player covering their entire card in the allotted number of balls drawn is $500.00.The consolation prize is $100.00 minimum The amount of numbers drawn will increase by 1 number every other session that there is not a winner.Before the Bonanza Game starts, if you do not like the card you are playing you can trade it in for a new card at a cost of 50 cents. Buddy Games —- These games will be regular bingo games.The person sitting next to the winner (left or right) will receive a voucher for a 12 face packet of cards.This voucher must be used within 30 days. 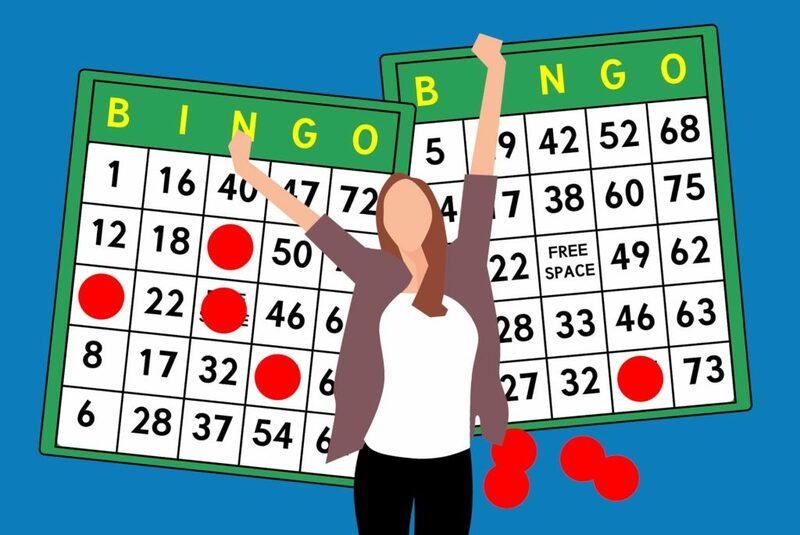 When there are multiple winners the regular pot will be split between the winners, and winners will draw a bingo ball to determine who receives the buddy game prize.The minimum payout on this game will be $25.00. If the bingo game winner is on the end of a table row, the buddy game prize will go around the end of the row to the next person. Quick Bingo Games —-This is a cover all game. Games are sold on two different colored single faced sheets for $1.00 each or 6 for $ 5.00 (3 for each game) The numbers are called every 3 to 4 seconds. Income from this game is divided into thirds.1/3 will be paid on the orange,1/3 on the green and 1/3 to the host. Stamp Game —- This game is played as two separate games with two separate winners, however, it is played on the same sheet of paper.To win the first game the winner will need 1 postage stamp. The second game will resume until a winner completes 2 postage stamps on the same card. The payout for this game is $10.00 more than regular games. Inside Picture Frame —- This game is won when a player completes the inside picture frame.The payout is $10.00 more than regular games. 5 Numbers or less —- We will add $10.00 to the prize for any valid Bingo in 5 numbers or less.